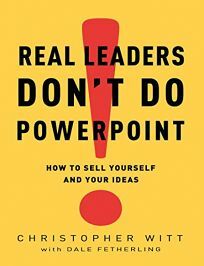 In Witt's succinct and humorous assessment of leadership strategies and the art of the public presentation, the business consultant focuses on the basics and the particulars that often go by the wayside when speakers rely on crutches like PowerPoint. A good speaker and leader knows that the individual is inseparable from his or her message, that ideas must be conveyed simply and powerfully, and that conviction is paramount to get others on board. Witt, founder and president of his own Witt Communications company, goes into great detail illustrating exactly what a successful speaker does and how those skills translate to good leadership. While Witt's primer doesn't say anything particularly new, it's a fine demonstration of his principles at work: well-organized and straightforward, with plenty of concrete take-away techniques. Geared toward those looking to get a leg up at work, shape their ideas and overcome the public speaking jitters, Witt's quick, witty instructional makes a fine addition to the office arsenal.